A wonderful itinerary encompasses some truly remarkable destinations for the kind of trip you’ll reminisce about for many years to come. 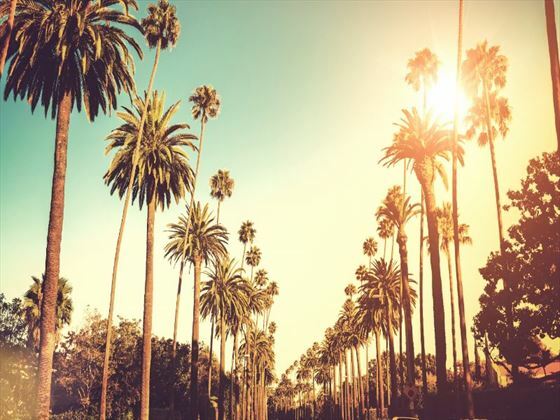 Beginning in Los Angeles, you’ll spend a few days getting to know this famous city before heading to Fiji for a tropical getaway. 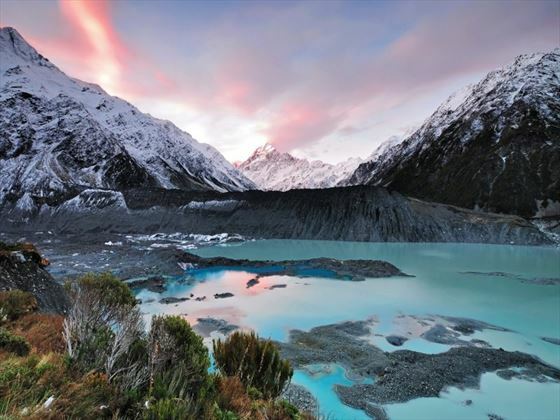 From here, make your way to Auckland to begin your 16-day self-drive adventure through New Zealand’s breath-taking landscape. End your trip with a relaxing four-day stay in Singapore for the ultimate getaway that combines unique experiences, beautiful beaches, vibrant cities and awe-inspiring scenery. Upon arrival into Los Angeles, transfer to your hotel for your two-night stay. This fabulous city has so much to offer in the way of shops, restaurants bars and culture. Spend time exploring the museums and galleries before soaking up the sunshine at the nearby beaches. In the morning, take a taxi to the airport for your flight to Fiji which will actually arrive two days later. Upon arrival, transfer to your hotel and embark on a relaxing four-night stay. 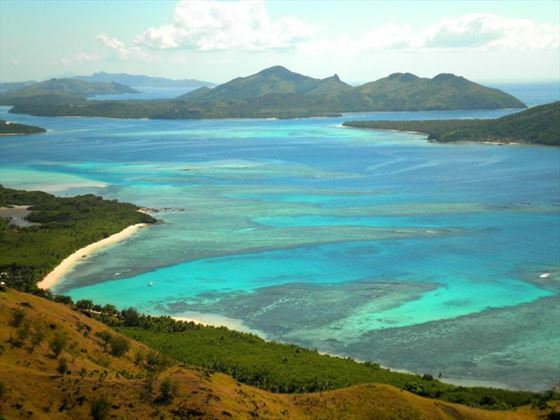 The beauty of Fiji needs to be seen to be believed – picture powder-soft beaches, endless sunshine and azure waters for the perfect tropical paradise. Alternatively, you may wish to visit the Cook Islands – please call one of our travel experts to tailor-make your trip. Transfer to the airport for your flight to Auckland – upon arrival you’ll be transferred to your hotel, with the rest of the day free for you to explore. 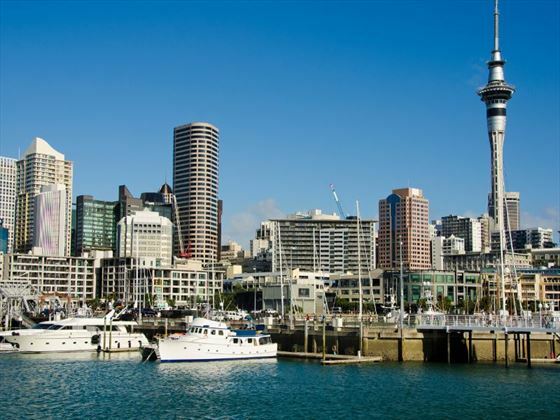 Auckland is a fantastic city that’s teeming with exciting opportunities and attractions. From the vibrant fashion and culinary hot spots on the Ponsonby and Parnell roads to the beaches of the west coast, and much more in between, this is a city that caters to everyone. You can either spend the day exploring or relaxing – it’s your choice. Collect your hire car this morning and begin exploring the city. This is New Zealand’s largest city so you won’t be short of things to fill your day with. Waiheke and Rangitoto Islands are worth visiting for a hike and to admire the views, and the Maritime Museum is a great spot for learning more about the nautical element to this city. West Auckland has a beautiful combination of rainforests and beaches, making it a wonderful spot for relaxing and enjoying the views – Muriwai Beach is a popular choice where you can see one of the world’s few mainland breeding colonies of the Australasian Gannet. There are some great wineries here too, so you could incorporate a tour into your day trip. Drive south from Auckland on the State Highway 1 into the dairy pastures of Waikoto and along the namesake river to the city of Rotorua. This is considered to be the cultural heart of Maori heritage and a great spot for learning more about Maori customs, traditions and history. In the evening, head to Tamaki Maori Village where you’ll enjoy authentic singing, dancing and performances before tucking in to a traditional hangi feast. 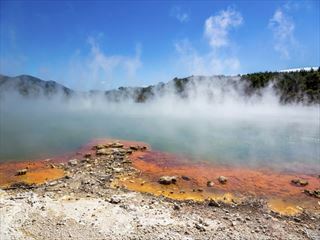 A geothermal destination sitting directly over the world’s most volcanically active regions, you’ll sense that Rotorua is unique from the moment you arrive. 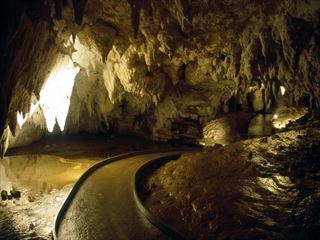 From the smell of sulphur to the steam rising from the pavements, this is a destination unlike any other. 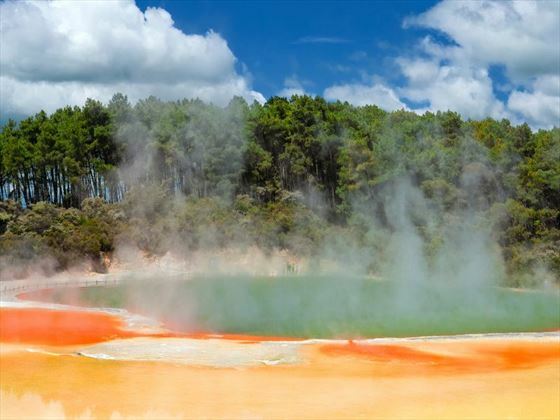 Visit the Wai-O-Tapu Thermal Wonderland, around 30 minutes away, to explore the geysers, sulphur ponds and thermal pools. You could also visit the Buried Village or village of Te Wairoa which was destroyed during the Tarawera eruption – this is now registered as a historic area and has a fascinating museum telling the story of the area. There are some really unique activities to enjoy in Rotorua, including farm tours and sheep shearing shows, fishing and adrenalin sports. As you make your way to Wellington, you’ll journey through the township of Taupo and the largest lake in the country – Lake Taupo. North of the town are the Huka Falls which are worth the short detour for their splendid beauty and awe-inspiring scenery. The lake itself is actually a giant volcanic caldera formed during one of the world’s largest ever eruptions. Skirting Tongariro National Park, you’ll be met with the 2500m peak of the volcanically active Mt Ruapehu. You may recognise Mt Ngauruhoe as it was used in the Lord of the Rings trilogy for the setting of Mt Doom. Heading south towards Wellington, you’ll pass the rural towns of Taihape, Bulls and Mangaweka before reaching the Kapiti Coast. Drop off your hire car at the terminal depot then board the Interislander Ferry, crossing the Cook Strait to the South Island. This journey takes around three hours but has often been described as one of the most breath-taking and beautiful ferry rides in the world. The route passes several interesting points, including Pencarrow Head which houses New Zealand’s oldest lighthouse, Red Rocks which is home to a seal colony and Oterangi Bay. Blenhiem is a picturesque area which sits at the heart of the largest wine producing region in New Zealand – Marlborough. 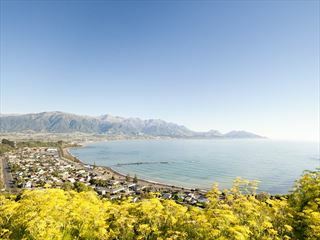 Cross the Marlborough ranges towards the Kaikoura Coast – one of the most beautiful on the South Island. This route offers the opportunity to see some of the native wildlife, including seals and seabirds. 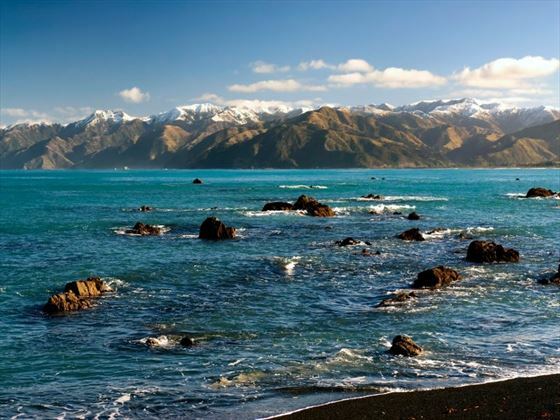 Whale watching, in particular, is what this region is known for – whales can be seen in Kaikoura all year. Swimming with seals is another fun and unique experience. Continue along the coastline before turning inland to journey through the Waipara Valley. Hamner Springs is a great detour if you’re looking to unwind in the thermal pools for an hour or two. Upon arrival into Christchurch, you’ll find yourself within easy reach of the International Antarctic Centre which provides a glimpse into life in the frozen portion of the world. A compact city, Christchurch can explored on foot or by hopping on and off the quaint trams. Take a wildlife cruise to see the rare hectors dolphins or, for a unique evening, visit the Tamaki Heritage Village which is an interactive outdoor theatre to immerse you in Maori culture, finished off with a hangi meal. Head into the heart of the South Island today with a route that takes you over the vast Canterbury Plains and into Mackenzie Country. You will ascend Burkes Pass to the picturesque town of Lake Tekapo which is a great spot for fishing, horse treks, boat trips and even a scenic flight. From here, Lake Pukaki is just 30 minutes onwards and will reward you with awe-inspiring scenery and the gateway to Mt Cook National Park. The Sir Edmund Hillary Alpine Centre at the hotel is a must-see. The journey from Mt Cook to Queenstown offers up myriad delights, from Twizel which was the setting for countless scenes in the Lord of the Rings films to the Lindis Pass – one of the highest roads in New Zealand. The sheer cliffs of Kawarau Gorge will lead you into Queenstown and the Gibbston Valley, which is a renowned wine producing region. As you approach Queenstown, you’ll be amazed by the beauty of the Remarkables mountain range as the backdrop. Spend the day in Queenstown – adventure capital of the world! From wine tasting to bungy jumping, there’s something for everyone, depending on the type of pace you want to set to your day. The Gibbston Valley is situated just outside of Queenstown and is great for wine tours and sampling the local produce if you want a relaxed activity. Likewise, Arrowtown is a historic gold mining town with original buildings and some great shops. For the active visitors, there are countless activities to make the most of, including hiking, whitewater rafting, mountain biking and skydiving – the list is virtually endless. Follow the route along the shores of Lake Wanaka and Hawea before entering the township of Makarora. Descend into the beautiful Mt Aspiring National Park and towards Haast Pass, where crashing rivers and elegant waterfalls meet you at every corner. After crossing the river, you’ll first be met by Fox Glacier then the Franz Josef township which is a further 45 minutes on from here. 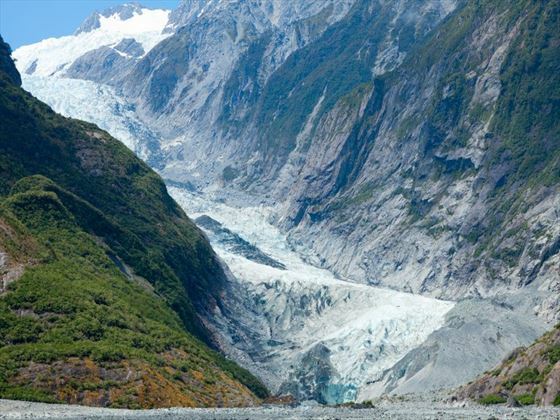 Franz Josef is most famous for the mighty glacier, with few places in the world having such a large glacier at almost sea level. Even less have the lower slopes among rainforest, making this a really unique natural attraction. There are numerous walks you can take to and on the glacier. However, while you can walk without a guide along the valley floor you must take a licenced tour to get any closer than 100 metres of the glacier. Helicopter flights with glacier landings are the most popular way to experience Franz Josef and offer unbeatable views of the scenery. Drive north from Franz Josef and venture through the historic gold mining region of Ross and the town of Hokitika. The starting point for the scenic Tranz Alpine train and the largest town on the west coast, Greymouth, is your next stop. This is considered to be one of the most beautiful train journeys in the world, working its way along the west coast and the Tasman Sea to the east coast and the Pacific Ocean. 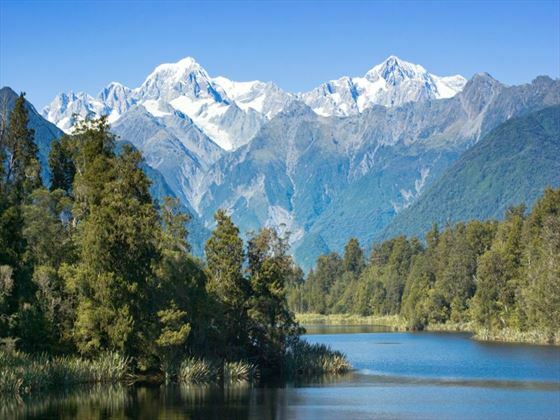 You’ll pass the stunning Otira Valley and the mountains of Arthur’s Pass National Park, as well as the Southern Alps. The train arrives into Christchurch in the early evening. Transfer to Christchurch airport for your flight to Singapore. Upon arrival, you’ll be met and transferred to your hotel which will serve as your base for the next four nights. The rest of your time here is at leisure to make the most of this vibrant city at your own pace.